The DS-U2-I satellites were Soviet ionospheric research satellites launched as part of the Dnepropetrovsk Sputnik program. These satellites were used to study the effects on radio waves of passing through the ionosphere. The desired signal was received at all working frequencies: for the first time ever, the passage of 31.8 kHz and 44.9 kHz radio-waves through the ionosphere was confirmed. The hypothesis of the ultralow frequency electromagnetic waves passage through the ionosphere was confirmed. The data allowed estimating charged-particle concentration in lower ionosphere versus time and other factors. 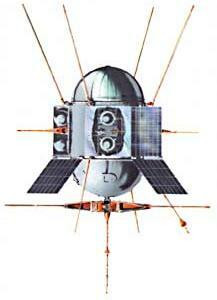 The first satellite of this type, Kosmos 119 was launched on 24 May 1966 on a Kosmos-2 booster from Kapustin Yar. On 30 November 1966, it decayed from orbit and reentered the atmosphere. The second satellite of this type, Kosmos 142 was launched on 14 February 1967 on a Kosmos-2 booster from Kapustin Yar. On 6 July 1967, it decayed from orbit and reentered the atmosphere. The third satellite of this type, Kosmos 259 was launched on 14 December 1968 on a Kosmos-2 booster from Kapustin Yar. It decayed from orbit within a few weeks of its launch, reentering the atmosphere on 25 July 1970.